On November 16, the fifth and sixth grade music ensembles performed for the middle school meeting. 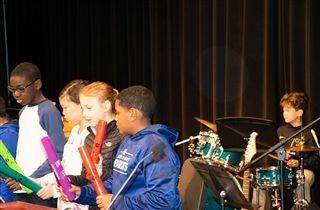 Fifth grade, conducted by Karen Welsh, performed “Eye of the Tiger (Rocky)” accompanied by boomwhackers, hand percussion instruments, and drum kit. Sixth Grade, conducted by Sarah Stone, performed the jazz standard “What a wonderful world,” by Louis Armstrong. Students were featured on drum kit, electric guitar, keyboards, harp, percussion, guitars, and ukuleles, in addition to violin and cello. Congratulations to all involved!